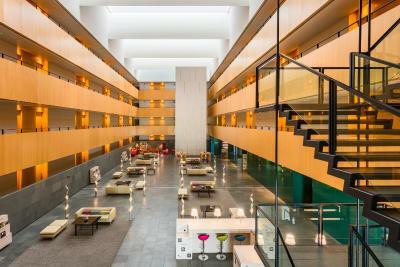 Lock in a great price for Tryp Barcelona Aeropuerto Hotel - rated 8.1 by recent guests. Room was ok, for an airport hotel more than enough. People on reception very friendly. Breakfast was very very good, the variety of food impressive. Close location to the airport was the main draw and very convenient with free airport shuttle. Staff very welcoming and helpful at check in, good location for those travelling via the airport. Shuttle bus was convenient and the hotel was clean. 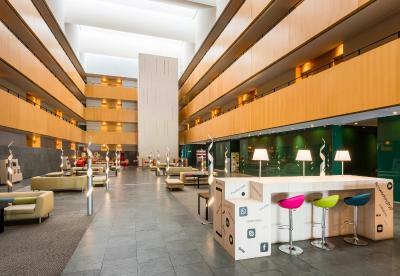 I needed a Barcelona Airport Hotel due an early flight the following day. This hotel was available. It ticked all the boxes and it was reasonable value for money. Alarm call worked fine and although I was leaving too early for breakfast they had a bar where you could coffee, a croissant etc. They also have on site parking in the basement at an additional but not excessive charge. Catering staff very good. Free shuttle excellent and well organised. very good shuttle service between hotel and the airport. very good breakfast , very kind to offer chopsticks for Asian people. 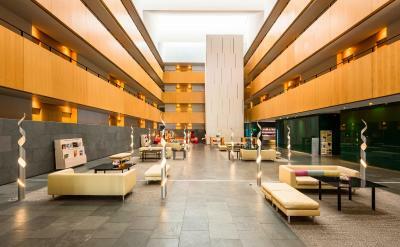 Set 5 minutes’ drive from the Barcelona Airport's T1 Terminal, Tryp Barcelona Aeropuerto Hotel offers a free 24-hour shuttle bus to this terminal, subject to availability. 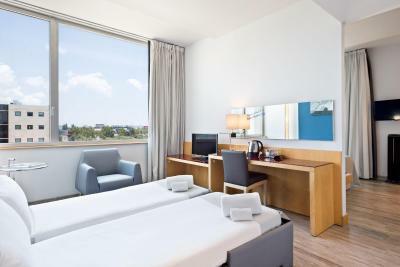 The hotel has air-conditioned rooms with satellite TV, free Wi-Fi and room service. 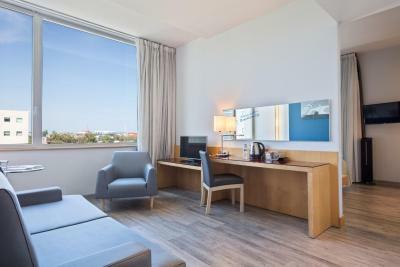 The modern rooms at the Tryp Aeropuerto feature parquet floors, a work desk, and a private bathroom with bath or shower. A buffet breakfast is served daily in the hotel’s bright dining room. There is also a lobby bar and a snack bar serving light meals throughout the day. 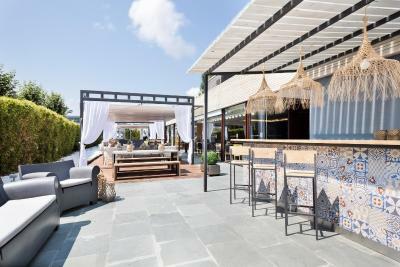 Barcelona city centre is just 15 minutes’ drive from the Hotel Tryp Barcelona Aeropuerto, while the shopping centres in El Prat de Llobregat are around 4.3 miles away. You can drive to the beaches of Sitges in under 30 minutes. 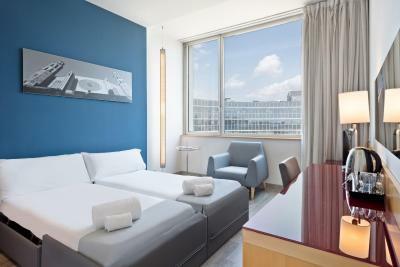 Tryp Barcelona Aeropuerto Hotel has been welcoming Booking.com guests since 9 Jun 2005. 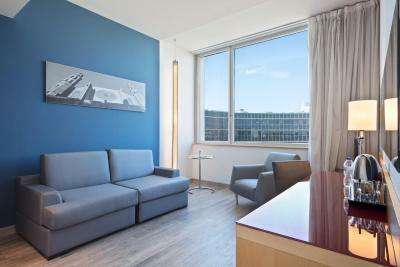 When would you like to stay at Tryp Barcelona Aeropuerto Hotel? This bright, spacious room features parquet floors, a work desk and a private bathroom. It also comes with free internet access. Please note that airport transfer must be requested in advance. The Premium Room has stylish décor, free internet and a premium bed designed by Flex. There is a mini-bar. 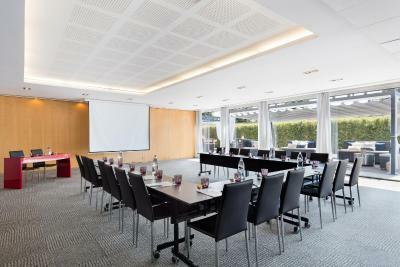 This room includes a transfer from and to Barcelona El Prat Airport. Please note that airport transfer must be requested in advance. 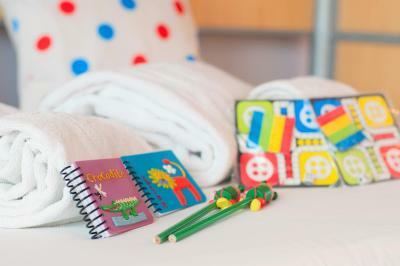 This air-conditioned room offers 1 double or 2 single beds, and a bathroom with free toiletries and hairdryer. There is a flat-screen satellite TV and a safe; and it has city views. This room has a selection of fitness equipments, such as a treadmill and elliptical or exercise bike. A fitness kit, including fitness accessories, exercise mat, mineral water and two extra towels, is also provided. 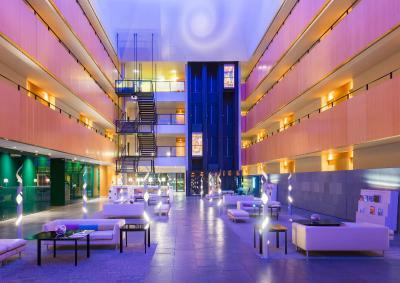 A transfer from and to Barcelona El Prat Airport is included in the room rate. Please note that airport transfer must be requested in advance. This suite has a minibar, air conditioning and soundproofing. This suite features a tea/coffee maker, air conditioning and soundproofing. This suite has a flat-screen TV, tea/coffee maker and air conditioning. 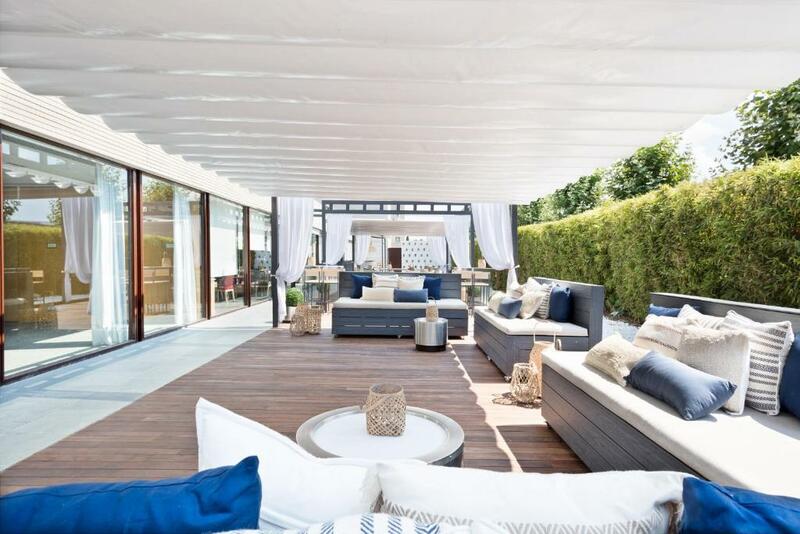 This suite features a soundproofing, satellite TV and air conditioning. 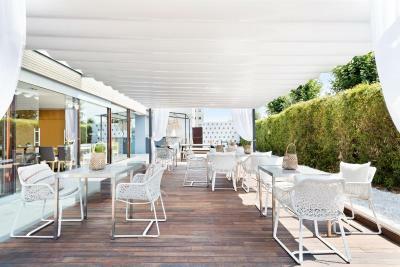 House rules Tryp Barcelona Aeropuerto Hotel takes special requests - add in the next step! Free! All children under 3 years stay free of charge for children's cots/cribs. 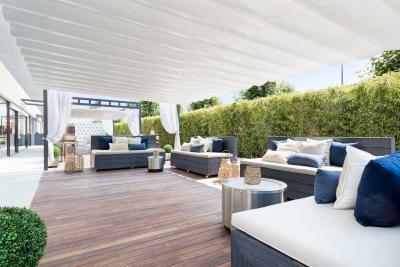 Tryp Barcelona Aeropuerto Hotel accepts these cards and reserves the right to temporarily hold an amount prior to arrival. There is a 50% parking discount for stays of 4 or more days. Please note that airport shuttle service is subject to availability. Please note that for reservations of 5 nights or more, different deposit conditions may apply. The road noise and it was on a business park, so you could only eat at the hotel or take a taxi elsewhere. The windows could not be closed properly. Very warm at night with no air conditioning and too noisy to keep window open. The hotel shuttle does not drop you off anywhere near airport ticketing area. We did not eat breakfast at the on-site restaurant, because we left the hotel at 0600. The restaurant had good food; however, there were not too many choices for someone with a restricted diet. One elevator and stairway at front but no way to directly get up to rooms at the other end. Room comfortable, water in shower was hot, room was clean. We wanted an airport hotel for an early morning flight but it was in an industrial area and there were no outside services convenient to it. That being said, we were tired and didn’t need to leave for anything. Therefore it was perfect. Location, excellent staff - nothing wrong with it except poor choice and expense of the food! Aircondition didn’t work, very hot room and highway behind the window was noisy. Worked good for one night. Rooms located on the side of the highway are way too noisy - poor sound proofing meant I did not sleep well. Room was warm, air conditioning system old and seemingly only capable of generating more hot air. AIRPORT SHUTTLE BUS VERY CONFUSING AT LEAST AT TERMINAL 2 AS THE BUS DOES NOT HAVE A SET PARKING SPOT. AND THERE ARE NO SIGNS AVAILABLE. I really liked and appreciated the Front desk staff who guided us through out our trip. the hotel is very close to the metro which was great to commute in.i like how Eco friendly the hotel is! No breakfast. Nothing to eat at the bar. Location near Airport , front desk very friendly , restaurant inside hotel foods is so good .